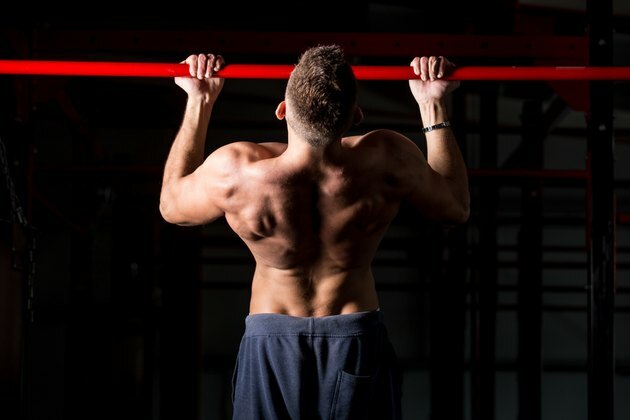 The pullup exercise requires you to simultaneously use the muscles of your back and biceps to elevate your body so that your chin is above the height of a suspended bar. You can tailor your hand position and movement for the pullup exercise so that your biceps are the primary focus of the lift. This is important for individuals who are performing a biceps workout or whose biceps have become the weaker link in performing traditional pushups. Place a small box underneath the pullup bar. Step onto the box and grab the long bar with an underhand grip so that your hands are spaced shoulder-width apart. Allow your body to hang, and if your feet touch the floor bend your knees so that your lower legs and feet are off of the floor. Pull your body up to the bar with your arms. Lift your body up until your chin has reached a height higher than the bar. At this point, slowly relax and allow your body and arms to descend back to full extension. The neutral-grip pullup not only targets your biceps muscle but the brachialis as well. The brachialis is also located on the front of the upper arm and is important for biceps size. The pullup bar you are using must have hand attachments that run perpendicular and even to the standard longbar. Turn your hands so that your palms face each other and then grip the handle bars with your hands in this position. Allow your body to hang at full extension and in a relaxed state. Now, pull forcefully on the handle bars with your hands. This will cause your biceps and brachialis muscles to contract. Keep pulling until your nose is at the same height of the hand grips. Relax and repeat. The partial pullup uses the movement and hand grip of a standard pullup but limits the range of motion to the portion of the lift that maximally targets the biceps. Get in standard pullup position by gripping the overhead bar with an overhand grip with your hands spaced no more than shoulder width apart. Start with your arms bent and your chin above the bar. This may require you to jump off of the ground or chair a bit to get in this position. Now, allow your arms to relax until they form 90-degree angles at your elbow joints. This is normally the half-way point of the pullup exercise. At the 90-degree point, pull your body back up so that your chin clears the bar. Continue raising and lowering yourself from the 90-degree angle spot until you have completed your target partial pullup number. While each of these hand positions and movements emphasize the biceps, your back muscles will inherently try to assist with the movement. To combat this, you may utilize a weightlifting technique called "pre-fatiguing" to take your back out of the equation. To use pre-fatiguing, you need to perform several exercises that primarily work your back muscles prior to performing your biceps-focused pullups. Choosing the right exercises is difficult because your back and biceps normally work in tandem; however, pullovers and other exercises that utilize a straight-arm position to target the back will work best. Muscles and Fitness: Is Pre-Exhaust Training Effective? Can You Do Pullups on a TRX Trainer?